For 27 years, AVA has transformed more than 100,000 victims to victors. We work to help victims and witnesses of crime to become survivors by helping people maintain their dignity and restore their lives. Our highly qualified, full-time and volunteer staff specializes in homicide, child abuse, domestic violence, identity theft and bank fraud, and general crimes including armed robberies, sexual assaults and terrorist threats. We advocate for the fundamental rights of people using five distinct approaches: we stabilize lives, meet emotional needs, reinforce safety and security, provide courtroom and criminal justice advocacy and raise awareness about public safety and policy through community education. AVA advocates for the fundamental rights of victims of crime with compassion, dignity and respect. AVA provides comprehensive services which remove barriers, strengthen victims and their families and foster a healthy transition from victim to survivor. The Georgia Crime Victims Bill of Rights, enacted to recognize victims’ basic rights and to require the city to commit resources to address the needs of crime victims, gave way to the city’s first Victim Witness Assistance Program (VWAP) in 1984. Established by the Metropolitan Atlanta Crime Commission, VWAP became a trusted resource of comprehensive services to assist victims and witnesses of crime through the Atlanta Municipal Court System, strengthen families and foster healthy transition from victim to survivor. In 2005, Atlanta Victim Assistance, Inc. emerged as an independent organization, operating as a 501(C)3 non-profit, advocating for the fundamental rights of victims and witnesses of crime. 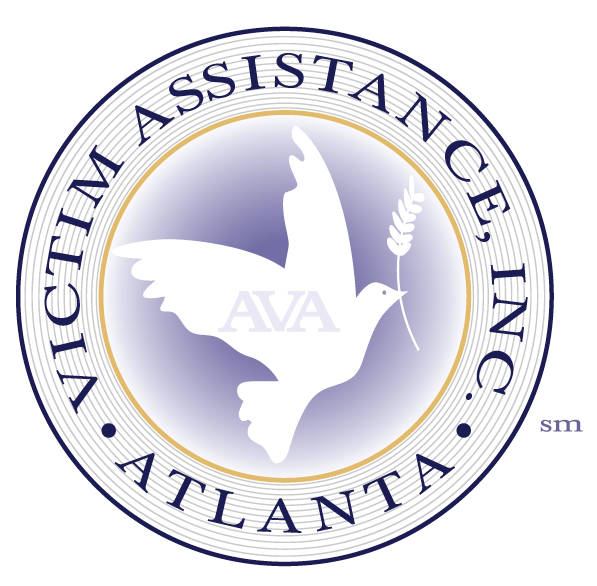 Since then, AVA has partnered with the Atlanta Police Department to expand its reach and provide more hands-on services, such as crisis intervention at the scene of the crime, support groups for survivors and victims of homicide and domestic violence, education on the criminal justice process, and response to a 24-hour help line. AVA advocates work directly in the police zones, responding to calls, assessing victims’ needs, and providing pre-case intervention and follow-up. Placing advocates in the zones also facilitates our community outreach efforts, which include providing awareness and education programs to neighborhood associations, schools, and in the immigrant population. Be treated with fairness and with respect for the victim's dignity and privacy. Be reasonably protected from the accused offender. Be notified of court proceedings. Be present at all public court proceedings related to the offense, unless the court determines that testimony by the victim would be materially affected if the victim heard other testimony at trial. Confer with [an] attorney for the Government in the case. Information about the conviction, sentencing, imprisonment, and release of the offender.